Your little one will not be a tiny bean that solely nurses or drinks formula forever. At some point, they will grow old enough to start sitting at the table and eating along with the rest of the family. When the time comes, they will need a high chair in order to provide the proper security as well as allow for them to reach their food. While a stationary high chair may work for some, many others choose the convenience and portability of a folding high chair. As your child develops, they will require transitional tools to go from one stage to the next. One of these transitional tools is high chairs. A high chair is made for that time between nursing and childhood. High chairs are chairs that have safety harnesses and other features to keep the little one seated in place. They also have trays that can hold food, toys, or other items within arms reach of the child. High chairs are mostly used as a place for infants to eat their snacks and meals in a controlled and safe environment. During the first few months of your child’s life, they will be exclusively bottle-fed or nursed. During this period of time, their meals are given to them while they sit in their parent’s or other guardian’s arms. When your little one reaches around 4 to 6 months, they will start learning how to sit up on their own. It is at this time that they can start being set in high chairs during their feedings or to hold them during other entertainment activities. This will free up the mother’s hands and teach the child to start feeding themselves. Around 6 months is when your little one will begin eating solid food, according to Baby List. At this point, high chairs become a near necessity to a mother who wants to control the mess as well as allow their child to reach their food. Regular chairs do not have the proper restraints to keep babies from falling. Chairs are also often times not tall enough for your infant to be able to reach the table. Older children can use booster seats or other types of seating. This is not the best choice for younger infants as booster seats do not always have the proper harnesses for a younger child. High chairs do have all the proper safety needed for your little one as well as a tray that they can access easily. There are other safe places for your little one to eat. Some parents let their infants eat while they are strapped in their carriers. Places like carriers do not have a tray to place the food on. They are also much more difficult to clean crumbs and drips out of. High chairs are made with easy clean surfaces. Walkers and swings are both popular choices for places to set young children with their snacks. These add the risks with being movable appliances which can pose the risk of chocking. High chairs are stationary to minimize the choking hazard. They are also placed at a height so that your little one can be next to the table during family mealtimes, which those other appliances do not offer. Folding high chairs are a popular choice out of other high chairs for several reasons. The main reasons are their portability and easy storage. Folding high chairs can easily collapse and be brought to other people’s homes. They can also be collapsed for carrying them around the house so your little one can eat their snacks in whichever room you are. They can also be collapsed to store between uses. With all the baby equipment needed around the house, every inch of space is precious. Being able to fold up the high chair between uses clears away just a few more of those precious square feet that can be used for other activities with your little one. There are several different types of high chairs outlined by Parenting.com. Many of these types are offered as foldable versions. The main type of high chair though is the standard high chair. This consists of a chair and harness with a tray. These high chairs offer many additional features as well. Most foldable high chairs will be the standard high chair. European high chairs are similar to the standard high chair except for one very obvious difference. These do not have trays. They are simply the chair portion and are meant to be used at the table. These are most often used for toddlers to young children. It is a good way to help your little one feel a little more part of mealtime. But, this style also limits where the chair can be used as it does not have its own tray. The clip-on high chair is an alternative to the folding high chair. It is much smaller so it is sometimes easier to travel with this type of high chair. It is simply a chair that is clipped directly to the table. These have very strict weight regulations and cannot be used as long as a high chair. These chairs are also not universal to all tables, especially if a table is thicker or has any sort of lip. Booster seats are for older children. They offer many of the same features like a high chair in the way of a harness and a tray. Since they are for older children, the harness is not as secure. It is usually more of a seat belt. The booster seat is usually placed on a regular chair. The seat is then meant to give just a little extra of a boost for your child to reach the table until they are tall enough to reach the table on their own. A last type of seating is a chair harness. This is not technically a high chair as it provides not type of additional height. It is merely a harness that is placed on a chair to keep your child in place while they eat. It is the most portable and can be used if space is limited when traveling. In this way, your child can sit on whatever seating is provided without them falling. This type of seating should only be used for toddlers and children. Out of all these types of high chairs, the safest and most versatile type is the foldable standard high chair. This type can hold a child the longest with the best protection. As with all other products that are used with young children, safety should be a top priority when it comes to choosing a folding high chair for your little one. There are some basic safety features a good high chair should have, according to Consumer Reports. First, check for a harness. A high chair should have a five-point harness for the best protection. This will keep your little one from squirming out of their seat and falling during their meal. For a high chair to be safety certified, it only needs a three-point harness. Having a five-point harness is recommended, especially for younger children, because it keeps the child from standing up in their chair. This can cause the chair to flip over or them to fall out of the chair. A high chair should have a crotch post, also known as a leg divider. This is a piece of material or plastic that is solid and goes between your child’s legs and connects to the tray above. This is not required but is known as a safety standard that is highly recommended. Since a high chair is used while your child eats, it is very important that the high chair is stable and not mobile. If the high chair does have wheels, the wheels should also be able to be locked in place. Since folding high chairs are made to collapse easily for storage, it is important that they also have locks or other safety features in place that will prevent the high chair from collapsing during regular use. There are two main safety seals that a high chair could have that shows that the manufacturer met specific safety requirements. The first is the ASTM. They have outlined safety standards for all types of items. Products that have met their safety standards will receive their certification. The second certification is JPMA. This organization tests products for children and infants. If the product passes their strict safety testing, the product will receive their safety seal. While some items can be gotten cheaper by purchasing used, high chairs are not one of those items. The safety standards are constantly changing with high chairs. There have also been many recalls in the past. When purchasing a used high chair, it is always best to look at all the past recalls to double check that the chair you have is safe to use. Before purchasing a foldable high chair, double check that all the parts function as they should. Also be sure that no levers or buttons are within reach of your child. This is especially true of the tray. Many trays can be detached to clean or fold down. Your little one should not be able to detach the tray mid-meal and cause their food to fall everywhere. While using the high chair, be sure it remains in good condition. Check any small parts on the high chair to make sure they are not coming off. This is especially true for any screw covers, as they can easily pop off and land amidst your child’s food and pose a choking hazard. Also be sure that the edges are not growing rough and risk cutting your child. Always check your high chair’s weight limit. While most high chairs can hold a child up to 50 pounds, this can still vary from chair to chair. Many foldable high chairs have a lighter weight limit than a regular high chair. Also be sure to check your high chair’s stability. A good high chair will have a wider base that cannot be easily knocked over. When unfolding your high chair, double check that it is fully unfolded before placing your child in the chair. High chairs have many features that make them easier to use. Foldable high chairs can have many of the same features as a standard high chair, but they are more limited due to space limitations. Nevertheless, there are still many features that do a cross between a regular high chair and folding high chair, according to BuyBuyBaby. One key feature to look for when considering a high chair is how easy it is to clean the high chair. This is the location your little one will be dribbling mouthfuls of apple sauce. This is also the location your child will be throwing around that cake covered in icing on their first birthday. Very little of the food given to your child will stay on their tray. While bibs can catch some food, there will be plenty that will fall on their laps and be smeared all around them. Just realize that anywhere your child can reach, will eventually get some sort of edible or non-edible substance smeared on it. With this in mind, finding a high chair that is easy to clean is a must. The seat of a high chair can be the most difficult part to clean. A good high chair will make this process as easy as possible. There will be minimal cracks and nooks for crumbs to hide and milk to drip which could lead to mold and bad smells. The fabric should also be comfortable enough to not rub your child’s legs, but also water resistant and able to be wiped down easily after a meal. This could be made even easier if the seat cover can be removed completely to be thoroughly washed regularly in the washing machine. The tray is the second part of the high chair that needs to be cleaned regularly. On one hand, a quick wipe with a rag after a meal could clean up the tray. Some high chairs will offer the convenience of a double tray. In this way, you can take out the inner tray and throw it in the dishwasher between meals. If there is an extra tray that comes with the high chair, then your child can be eating in one tray, while the other is in the wash. Some high chairs offer wheels for the chair in order to move it about easier. This is not a common feature with foldable high chairs as they are already mobile and light for transitioning. If you happen to come across one that does have wheels, double check for a wheel lock and stability. As your child grows, so do their needs. A high chair that works for an infant may not work as well with a toddler. If you would like to make the most of your purchase, look for different adjustability options. This could be the harness, height, and seating. Some high chairs can even come apart and be set up as a different stage chair, such as high chairs where the seating comes off and is able to be used as a booster seat on its own. Folding high chairs cannot always be as adjusted as standard high chairs due to the fact that they are made minimalistic in order to fold smaller for transport. When it comes to folding, you will want to make sure it does actually fold compactly. The entire point of a folding high chair is the fact that it can be compacted for storage or travel. If a high chair does not fold much smaller than a regular high chair, it defeats the point of being a foldable high chair and a different chair should be considered. Some high chairs offer the feature of being reclinable. This feature is mainly to be used when your child is still young and is bottle fed as it makes this process easier. If you do not plan to use the high chair until your child is fully on solids, then this is not a necessary feature. Some high chairs offer a footrest. This can make the high chair more comfortable for your little one depending on their preferences. If a high chair does have a footrest, be sure it is adjustable or else the footrest could limit the amount of time your little one can use the high chair before their legs start to feel cramped. Foldable high chairs offer the best of both worlds. They offer the portability and space saved as the smaller seating options, but they also offer many of the same features as a standard stationary high chair. They may not have quite as many features as a regular high chair, but what they lack in features, they make up for in their ability to be taken anywhere. Keep in mind, folding high chairs do still have the same safety features as a regular high chair, so they can be just as safe. The Baby Trend Sit Right High Chair is a foldable high chair that is best for children and infants who are able to sit on their own. It comes in two fun design options: pink paisley and blue jungle animals. The high chair can fit a child up to 40 pounds. The high chair has many adjustable options. The first is its height adjustment. There are 6 different heights that the chair can be switched between. In addition, it also has a recline option with 3 different recline positions. A 3-point safety harness keeps your little one in the chair. The tray on the front of the high chair has three different adjustments as well. In addition to these adjustments, the tray can also be fully removed from the front of the high chair so that the chair can be slid up to the table and used as a booster seat instead. When it comes time to clean, the tray can be quickly popped off and cleaned in the dishwasher. The thin padding on the high chair can be wiped down between uses. It can also be completely removed and thrown in the washing machine for a more thorough cleaning. To fold the high chair, a release button brings the two leg pieces together. The tray disconnects from the front of the high chair and is then snapped on the back of the legs. The high chair is highly adjustable in height. The high chair offers reclining options. The tray can be removed so that the high chair can be used directly with a table. The padding of the high chair can be removed and machine washed. This is a more affordable high chair. The high chair only has a 3-point harness. The high chair does not fold very flat for storage. The leg divider is attached to the tray, not the chair. The entire high chair is very large and bulky. Many mothers choose this high chair because of its appealing price. There is quite a large number of adjustment options available with this high chair, despite being a cheaper product. The price, though, also reflects the quality of what is offered. Many parents have stated that this chair comes across as wobbly and altogether cheaply made. Even though it does have the option to fold away for storage, it is bulky and still takes up quite a bit of room. The Disney Simple Fold Plus High Chair is a lightweight folding high chair with a well-loved Disney character design. The high chair is very simply designed with a minimalistic approach in order to make the high chair as lightweight as possible for travel. The high chair is offered in five different designs. There are two Mickey Mouse designs and three Minnie Mouse designs for you to choose from for your child. This design is then on the seat cover only. The seat cover cannot be removed or changed out. Instead of being removed to clean, the seat is made out of a fabric that allows it to be wiped down between uses in order to keep it clean. The seat is not very adjustable compared to other high chairs. The only part of the high chair that can be adjusted is the tray area in order to give your child more room. There is a bar that runs across your child’s front. A leg divider is attached to the bar. The tray connects on to this bar. In this way, the tray can be removed for cleanings, or if you want to use the high chair without the tray, while still having the security of the front bar and leg divider. The tray has three different settings so that it can be moved as your child grows. In addition to the front bar and leg divider, the high chair also has a three-point harness. The base of the high chair is wide to help keep it stable while in use. When the high chair is not in use, it can fold up completely flat. The folding system is very quick and simple so that clearing up after a meal is a breeze. It is built flat and small enough so that it can even fit in the trunk of a car when traveling. The seat is available in a fun design for kids. The seat can fold very flat and lightweight for storage or travel. The tray can be removed for cleaning. The leg separator is separate from the tray. The seat does not adjust in height. There is no recline feature on the seat. The seat cover cannot be removed for a more thorough washing. There is only a three-point harness. The Disney Simple Fold Plus High Chair is a fun way for your child to enjoy snacks and meals surrounded by a familiar and well-loved character. This chair may not be the best choice for a permanent high chair at home due to its lack of features. If you are looking for a lightweight and compact folding high chair for taking with you on those car trips, then this high chair should definitely be considered. The Evenflo Symmetry Flat Fold High Chair is made for both use as a sturdy high chair every day, or an easy fold high chair to bring with you when you travel. It can fold down to as small as 8 inches in order to be stored in small places or the trunk of your car. 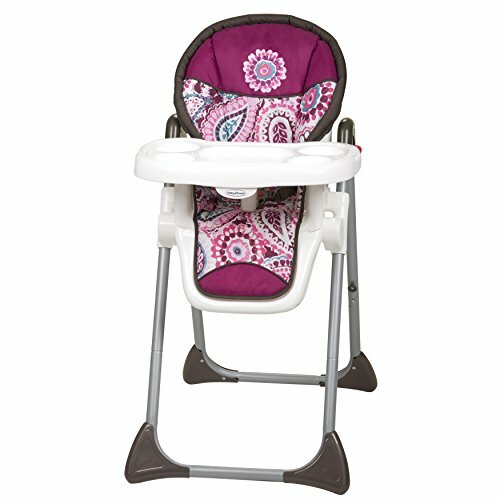 The high chair is offered in two different colors, gray square design, and black floral design. This high chair makes cleaning easy. There is a nesting tray that can be removed and placed in the dishwasher between uses. The material of the seat can be wiped down after the meal. It can also be fully removed and washed in a washing machine. The high chair is safe and adjustable to your growing child. It has a 5-point harness that will keep your child secure at all stages of their life. It also has a leg separator on the tray to keep your child from slipping out of the high chair. The high chair can adjust to your little one’s growth. The chair has two reclining options. The tray has three positions. There is a footrest, but it is not adjustable. The high chair is made to make it easy to travel. It folds easily between uses or when you are going out. When it is assembled, it can be moved from one area to the next by using its wheels. The wheels are located only on the front. The back has two stable legs that, when placed on the ground, will keep the front legs from rolling around as your child sits in the seat. The high chair folds up very compact. There are wheels to move the high chair around when assembled. A removable tray can be cleaned in the dishwasher. The seat padding can be removed and washed in the washing machine. The high chair is a little cheaper in quality than others. The tray does not remove very easily. The thick fabric of the seat offers little support. Evenflo offers another great option for a high chair that can fold up small enough to take with you when you travel. While many folding high chairs can be slipped into storage at home between meals, not all can fold as flat as Evenflo in order to fit into a trunk of a car. The main complaint with this high chair seems to focus on the lower quality of materials in comparison to the price. The JOOVY Nook High Chair boasts of being both a full-sized chair able to hold a child as large as 50 pounds, but also fold up the size of a beach chair to be thrown into a trunk of a car for traveling or storage. The high chair comes in five vivid color options. The seat is made to be easy to clean. The seat padding is made from a leatherette that can be wiped down between uses. It can also be fully removed and washed in a washing machine. The seat does, however, have quite a few seams and ridges in order to make it more comfortable for your little one. This, in turn, gives it more areas for food to get stuck. The tray has an insert that can be removed and washed in a dishwasher. The seat only has a few places it can be adjusted. The main adjustment is the tray. It has four different positions it can be adjusted to depending on your child’s growth. The tray can also swing to the side when your child is loaded into the high chair. The tray can be removed completely as well if needed. The footrest and the recline are not adjustable. Safety is the main concern with this high chair. It has a 5-point harness that will keep your child secure. It also has a leg divider that is attached to the high chair, not the tray. When you are not using the high chair, it can be folded up compactly. It even has a carry handle that makes it easy to transport it from place to place. The chair has a 5-point harness. The tray swings out, making it easy to put your child in the high chair. The high chair folds very compactly and easily. The chair is at a fixed recline which can lead to your child sitting in a slouched position. The high chair is very difficult to clean due to the nooks and crannies and the difficulty in removing the padding for the wash. This is a more expensive high chair. JOOVY’s Nook high chair lives up to its name as it really can fit in most nooks and crannies when folded up. The high chair is made of better quality materials and offers a convenient loading option with its unique swivel tray. As long as you are willing to invest the extra time needed to clean the nooks and crannies of this high chair, it can be a long-lasting option for either home or travel use. The Summer Infant POP and Sit Portable Highchair is a folding high chair made mainly for travel. This is a high chair version of those well-known folding canvas chairs many families bring with on picnics or camping trips. Now your little one can have their high chair brought along as well. While it is not the most attractive or versatile chair for home use, it has everything needed for outdoor and travel use. The chair has four lightweight legs and a fabric seat. It folds just like regular canvas camping chairs. There are no adjustable features, but this is how the chair remains small and lightweight for travel. To make traveling even easier, the high chair comes with an over-the-shoulder carrying bag. The high chair also has a storage pocket behind the chair to keep your little one’s toys or bibs nearby when traveling with the high chair. Even with the minimalistic design, it is still easy to clean. The fabric chair can be removed and washed in a washing machine. The tray can also be removed. It is not a large tray but is large enough to provide an eating surface without making the chair too bulky for traveling. The chair may not be very large, but it is still safe. It has a 3-Point harness for your little one. It can also hold children up to 45 pounds. A fabric leg divider also helps keep your little one safely in their seat. 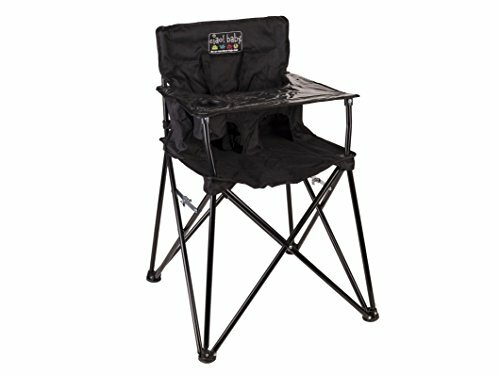 This is one of the easiest folding high chairs to travel with due to weight, size, and folding ease. The fabric is machine washable. The tray can either swivel or be removed completely. The high chair is shorter than a regular high chair, and you will need to sit when feeding your child. There is no adjustability with the high chair. It is not as large as other high chairs when it comes to seat and tray space. 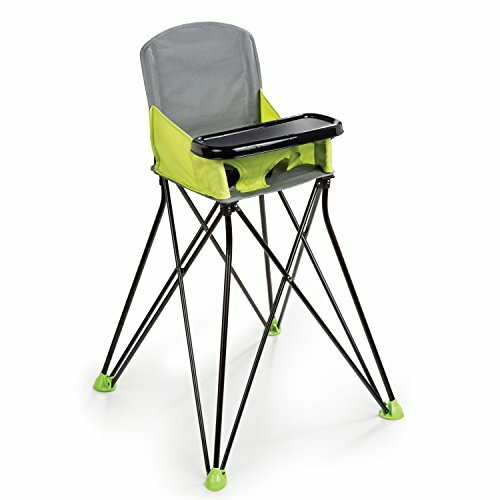 If you are an out-of-doors family and want to bring your little one along on your hikes, camping trips, and picnics, this high chair is designed for your lifestyle. From the carrying case to the compact design, it is perfect for traveling. If you are a homeowner with limited space and are looking for a folding high chair that you can store between uses, then this high chair may not be the best choice due to its smaller size and lack of features that would make it easier to use in an everyday home setting. The Ciao! Baby Portable High Chair is another travel-based high chair with a minimalistic design and features that make taking it along with you on hikes and camping trips a breeze. It comes in twelve unique colors and patterns allowing you to make the chair your own. The chair is built for safety. It meets all the safety guidelines of the CPSIA, ASTM, and EU safety guidelines. It comes with a 5-point harness as well as a leg divider. The high chair also has a tray with a cup holder. The chair can hold children up to 35 pounds. Cleaning is made easy with this chair’s quick wipe surface. The tray has a vinyl cover that can also be wiped clean between uses. The chair does not come apart, so it will need to be cleaned similarly to a camping chair, either with a garden hose or in a shower, when you want a more thorough cleaning. When the chair is not in use, it can fold up very compactly for travel. Even the tray collapses as it is not made out of hard plastic. The high chair is set up similarly to a regular camping chair with the fabric seat and foldable legs. In this way, the high chair can compact enough to fit in a carry bag that is then carried over the shoulder. The chair is very portable and lightweight with a carrying case. The high chair locks in place to avoid it collapsing between uses. It comes in many different colors and designs. No assembly is required as it is all one piece. The tray area is not very stable and tends to bow, causing food to slip onto your child’s lap. The chair is smaller than a regular high chair and may not fit all children. The high chair does not come apart to clean. Ciao!’s version of the travel high chair is similar to Summer Infant’s high chair in many of the features and functions of the high chair. Ciao! Does offer a more compact chair, mainly due to its tray not being plastic. The chair is also better quality, but with it comes to a higher price tag compared to Summer Infant. Both chairs are designed as traveling chairs for hiking, camping, and picnics and are not the best option for regular home use. 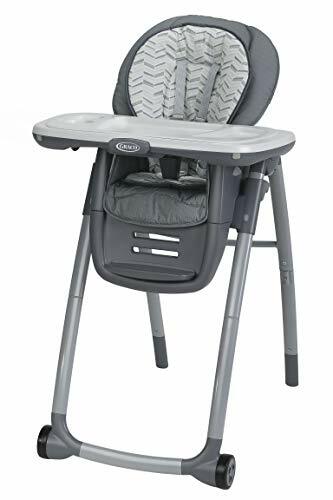 The Graco Table2Table Premier Fold 7-in-1 Convertible High Chair is one of the most versatile high chair options available that will last long after your little one grows out of needing a high chair. The best part is that even with all its uses, it can still fold away to be stored when not in use so that it takes up minimal space. This chair is far more than just a folding high chair. It offers seven different seating options to accommodate your child from infancy all the way up to their preschool years. First, it can be used for young infants due to its reclining options. Next, it can be used for older infants as a regular high chair. When your child ages even further, the top seating part can be removed from the base and placed on a chair as a booster seat. The fourth option is to remove the tray and chair part of the booster seat, and just keep the base with the seatbelt to help your child remain on a regular chair. A fifth option would be to use that same base but attach it to the high chair base instead of a regular chair, this can be used for older children without having to use a separate chair. A sixth option comes when the legs are taken apart. The top part of the legs will hold your child’s chair, the bottom part can be converted into a small table for your child to sit at. The last option for this high chair is to use the infant high chair seat as a booster seat on a regular chair, and using the separated base of the high chair as an older child’s chair so that both your infant and your child can be seated at a table. The high chair is highly adjustable. It can recline in three different positions so that you can use the chair from infancy until young child age. The height of the chair can also be adjusted to five different heights depending on the table being used. A removable footrest is also provided which has three different positions. The infant seat can hold children up to 40 pounds. The toddler seat options can hold children up to 60 pounds. The high chair is easy to clean. The seat pad can be removed and washed in a washing machine. The tray has an insert that can also be removed and is safe to clean in a dishwasher. The tray can be removed with one hand. The tray connects to the legs of the high chair when it is folded for storage. The chair also has wheels on the front which makes it easy to roll away for storage. It is not as easy to roll when assembled with a child inside. The high chair has seven different assembly options which can last till a child is 6 years old. The high chair is easy to clean. It has plenty of adjustment options to accommodate your child’s growth. It does not fold very compactly. It is more difficult to fold between uses. 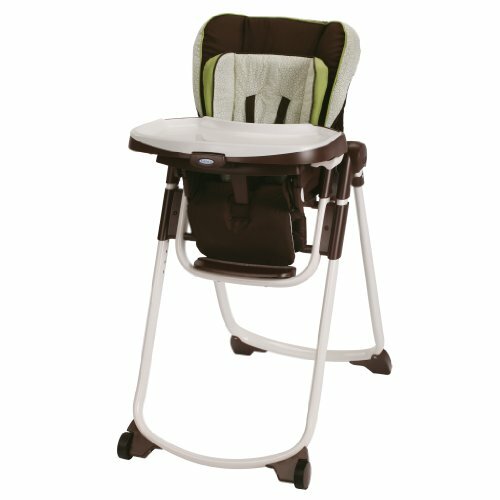 With all the features of the Graco Table2Table high chair, it is great for at home use. The features do keep the high chair from folding very flat so if space is really limited, or you would like to use the high chair for traveling then this high chair would not be the best option. Its multiple uses make it worth the higher price tag as you will be using it for years giving you the opportunity of getting your money’s worth of use out of the high chair even if you only use it for one child. The Graco Slim Snacker High Chair is one of Graco’s most compact folding high chairs along with the Slim Spaces high chair. The chair is available in two different color and design options. This high chair also offers a mesh basket underneath the chair to keep your little one’s supplies for quick and easy access during their meal. The high chair has the appropriate safety features needed for your child. The harness can be converted between a 3-point or 5-point harness depending on your child’s age and needs. The high chair also has a leg divider which is connected to the tray. The seat has three different reclining positions and a footrest for extra comfort. The seat padding can be easily wiped down between uses. It could also be removed, but it is very difficult to do so and is recommended just to wipe down the seat padding. The tray does not have a removable liner, and should also just be wiped down between uses. The high chair folds compactly for storage. There is a mesh basket for item storage. The harness has both a 5-point and a 3-point option. The seat padding is very difficult to remove and clean. There is no tray insert to make cleaning the tray easier. There are many nooks and crannies for food to get caught in. 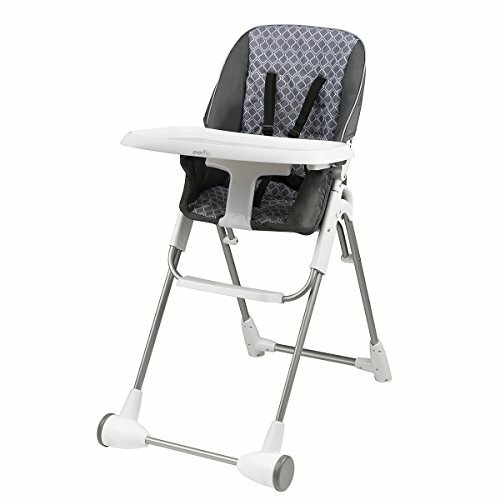 This high chair is one of Graco’s more compact folding high chairs. While it does offer a smaller size, it does not offer much in height or position adjustments. Nevertheless, many parents still love this high chair for its quality and use. The one major drawback of the high chair is how difficult it is to clean. The Graco Slim Spaces High Chair is Graco’s other ultra compact folding high chair option. It can fold as thin as 8.5 inches. The high chair is available in three different color options. This high chair also requires no assembly and is ready to use straight from the box. The high chair can hold children up to 40 pounds. 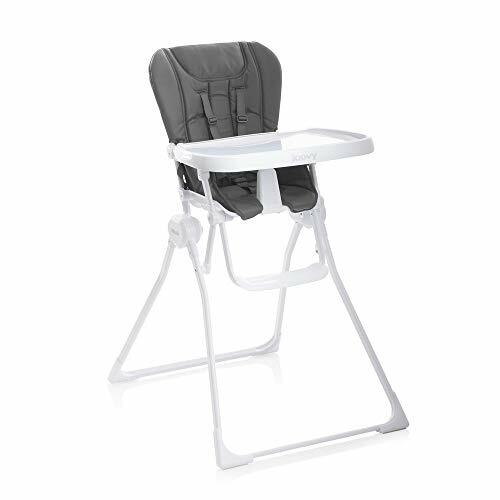 The Graco Slim Spaces high chair offers support even for young infants. The taller seat with plush padding in addition to the three recline positions allow your little one to sit safely in the seat during bottle feedings. There are also six height adjustments to allow you to fit the high chair to whatever table height you may have. Cleaning is made easy with this high chair. The seat can be wiped clean between uses. It can also be removed completely and cleaned in a washing machine. The tray also has a removable insert that can be taken out and cleaned in a dishwasher. The seat has a convertible 3-point and 5-point harness to keep your child safe. There is also a removable tray with a leg divider. The chair has two front wheels to make it easier to move the high chair about the house. The back does not have wheels in order to help keep the high chair stable when in use. This Is an ultra slim folding high chair. The padding can be removed and washed in a washing machine. The tray has a removable insert that can be washed in a dishwasher. The high chair is very adjustable to accommodate your child’s growth. The fabric of the seat does not wipe clean very easily and needs to be cleaned in a washing machine before it is really clean. The base of the high chair, when unfolded, is very wide. The Graco Slim Spaces High Chair offers a parent the space needed by its compact folding design. When it is unfolded, it has many features that can also be found in a regular high chair from safety to height adjustment. The only area that the high chair is lacking in is its ease of cleaning. 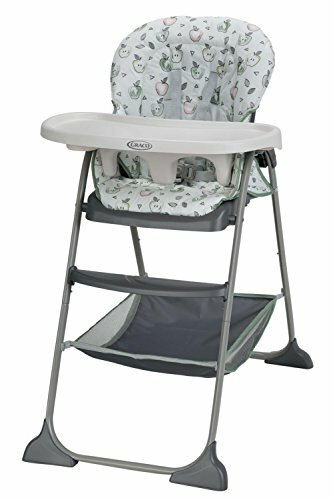 The Cosco Simple Fold High Chair is a simple fold high chair that is great for traveling. It does not have as many adjustments and features as some other high chairs offer. In return, it can fold up extra compact and make traveling even simpler. 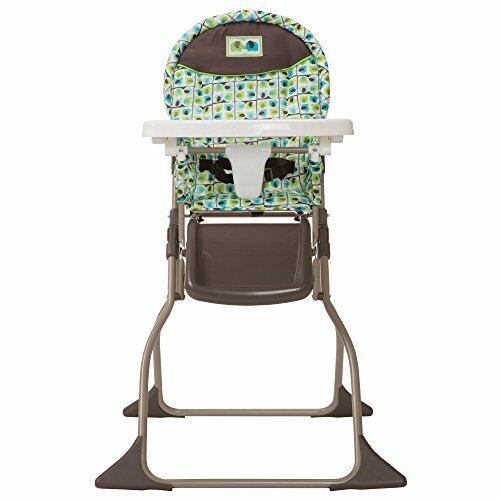 The high chair comes in thirteen different color and pattern options. The high chair can be cleaned quickly with simply wiping down the fabric of the high chair. The padding cannot be removed, so it can only be cleaned while on the chair. The tray can be removed, but there is no separate insert. The chair does not have any adjustments except for the tray. The tray has three different positions it can be moved to. The high chair does have a 3-point harness and can hold a child up to 50 pounds. The seat also has a leg divider that is connected to the chair instead of the tray. The chair is very compact and does not have any removable pieces to lose or break. The fabric can easily be wiped down. The chair is more affordable than others. The seat padding cannot be removed to clean. The tray does not have a removable insert. The height or recline cannot be adjusted. The Cosco Simple Fold high chair is just as its name suggests: simple. There are not many bells and whistles or removable parts that can fall off or get lost. While this may make the high chair less than ideal for everyday use at home, it can make it a compact choice for traveling or to keep at a relatives home for visits. This is especially true since the chair is very straightforward to use and clean by any person. Folding high chairs vary widely depending on their use. There are three main uses for folding high chairs, those that do not have much space at home and need a chair that folds away easily, those who need a simple chair to keep at a relatives home, and those who need a high chair that is lightweight for travel, hiking, or camping. Your specific need will decide which high chair best suits your life. An all-around great choice for folding high chairs that can be used in all those instances is the Graco Slim Spaces High Chair. 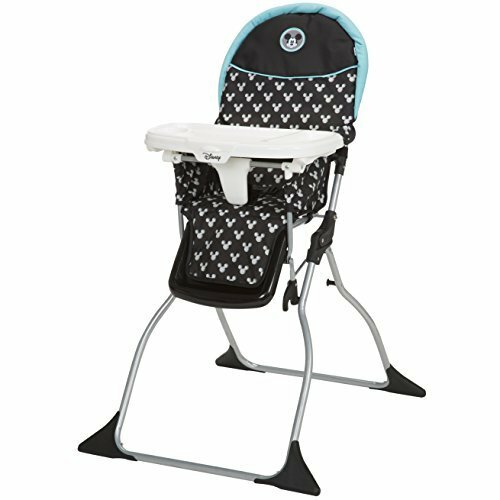 This high chair offers many great features as well as plenty of adjustability. This will help your little one to develop healthy sitting posture as well as be able to use the high chair longer. The convertible harness also keeps your child safe. All high chairs have their positives and negatives. The easiest high chairs to clean also have the least amount of features, which is usually why they are so simple to care for. Those that have all the features that make a high chair last longer and be more customized to your child’s size usually give up some of the convenience of cleaning. The Graco Slim Spaces chair is one of those high chairs that are not as easy to clean, which is its main fault. Many parents are able to look past this fault because of all the other great features and adjustable parts that it offers. This is why Graco’s Slim Spaces is one of the best folding high chairs available.